Stormwater Pollution Prevention Plans, or SWPPP, are required due to National Pollution Prevention and Elimination System (NPDES) requirements of the Clean Water Act on project sites where more than 1 acre of sediment will be disturbed (See EPA's website at http://cfpub.epa.gov/npdes/stormwater/swphases.cfm). The plan requires a site description, including a map; a description of sediment and erosion controls used on-site, including stabilization practices (e.g., seeding, brush layering, dewatering, mulching) and structural practices (sediment traps and silt fences). The SWPPP must also include a description of Best Management Practices (BMPs) to control stormwater run-off after completion of the construction project; and BMPs to control solid material and other construction waste. Maintenance and inspection practices must be described. The plan must be submitted to the EPA for review. An erosion control plan in the SWPPP format for any revegetation project is a good plan format to follow. Schedule restoration work to avoid soil exposure during the rainy season or heavy snow melts. Reduce the length of time and the amount of surface area exposed, especially where erosion potential is high. If disturbance is unavoidable, grade site to fit the surrounding terrain, soil type and native vegetation. Do not create steep slopes. The greater the slope, the more difficult it is to prevent soil erosion. Some erosion techniques will not withstand steep slopes or other conditions. It is important that you contact an erosion control expert regarding appropriate techniques to utilize for your site. Run-off should be minimized by directing water outside disturbed site and onto holding areas or vegetated areas. Using energy dissipating and water infiltration techniques, such as utilizing a buffer zone, temporary or permanent native seeding, ground cover, plastic sheeting and matting will also help decrease soil run-off. Covering exposed soil with properly weighted plastic sheeting will help prevent temporary construction site sediment loss. Monitor for erosion control success regularly. Site inspections should be performed a minimum of once per week on active sites, once every two weeks on properly maintained active sites, and within 24 hours of a 0.5 inch rainfall (Wright 2001). Plan on maintenance within your project budget. Many erosion control devices (including silt fences) are not designed to withstand snowfall weight and icing. Be sure sediment is secure, meaning revegetation of site is accomplished, including a good strong root structure of all plant material, or sediment covering which will not leach soil, before snowfall. It is recommended that all seeding and planting be completed before August 15 for Southcentral Alaska. Check the Contacts section to determine appropriate timing in your area. In water work must correspond to state, federal and local permit stipulations and time windows. Leave native vegetation on-site to prevent erosion of surrounding area. Try to decrease damage to surrounding vegetation by limiting heavy equipment work on it whenever possible. Vegetative mats will be salvaged from site as often as possible before construction and will be replanted on-site (See Vegetative Mat under the Plant Care and Preparation section). The root/soil structure of the plants for each mat must be salvaged to the depth appropriate for the species present. At least 1-2 feet of root material should be harvested. Remember to keep harvested material cool, moist and out of direct sunlight. Protect water bodies and wetlands from sedimentation by utilizing the above techniques and silt fencing (See Silt Fence Installation Step-by-Step). Wood fiber mulch applied at 2,000-3,000 lbs/acre, depending on site situation (soil type, area, etc.). Bounded Fiber Matrix (BFM) applied at 3,000-4,000 lbs/acre, depending on soil conditions. The slurry shall be mixed continuously as ingredients are added and for at least 5 minutes following the addition of the last ingredient before application begins. Slurry will be continuously mixed until used and application will end within two hours of the last addition. We recommend using natural biodegradable products whenever possible and care should be taken when applying material to prevent erosion, particularly of fertilizers. 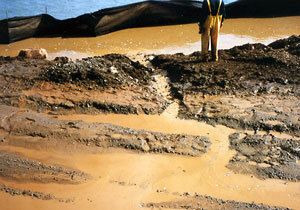 Trap and remove run-off sediment, which is caused from construction on-site. Remove built up sediment on silt fence upon reaching 1/3 the height of the silt fence. 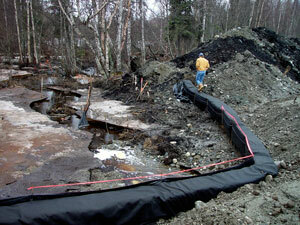 Reuse sediment in project or dispose at an approved upland site. Maintain erosion control devices until site is functioning with no sediment-laden run-off and plants have a well-established root structure, then remove silt fence. If proper erosion control devices are utilized and maintained, there should be trace sediment erosion off-site. Proper installation of a silt fence to isolate worksite from soil erosion off-site is shown in the adjacent step-by-step. 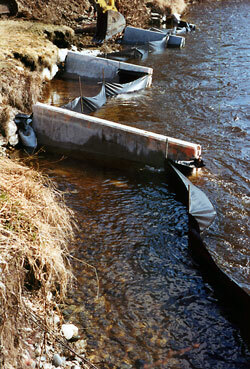 Commercially available silt fences are available from suppliers. Follow all manufacturers instructions for proper installation. Stakes should be placed closer together in situations where heavy sediment laden run-off or flow is expected. The range of stake placement is between 4-10 feet apart depending on expected flow, run-off area, and sediment amounts.